Operator that is used for mathematical calculation or arithmetic operation is called arithmetic operator. There are a number of Arithmetic operators that are given in the table. 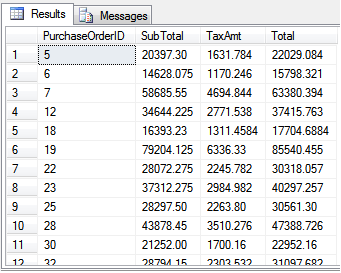 In the above example the + operator is used to add the SubTotal and TaxAmt column value and display the added value in a new column (Total). In this chapter we have learned arithmetical operator and it's type with examples. In the next chapter you will learn assignment operater and its type.